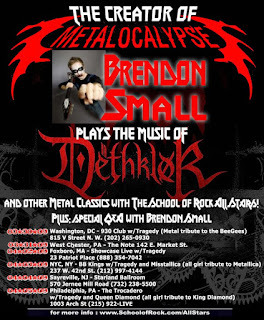 QUEEN DIAMOND, MISSTALLICA and Tragedy opening up for the School of Rock All-Stars w/ special guest Brendon Small (writer/creator of Metalocalypse, Dethklok, Home Movies). Kaleen & Gigi (of Queen Diamond/Misstallica) will also be performing w/ the All-Stars and Brendon. The All-Stars will be performing the music of DETHKLOK, as well as some of the "rock" gems from the series, some King Diamond, Metallica & Queen!